What is SCD and Paleo? One of my favorite Thai restaurants in Portland, My Thai (don’t have a website), makes phenomenal curries that are fresh, gluten-free, and great quality. Sometimes, they even feature a mango curry and it is so delish. I’ve been thinking about their mango curry since the last time I had the pleasure of eating it — about two months ago or so. Finally, I got the push to replicate it since mangoes were on sale at Whole Foods last weekend. Jesse and I were pleased with the results and thought it tasted even better the next day. We will definitely be making it again soon! Melt coconut oil in a large skillet over medium heat. Add the onion and garlic, and saute a minute or so. Then add the chicken and season to taste with sea salt. 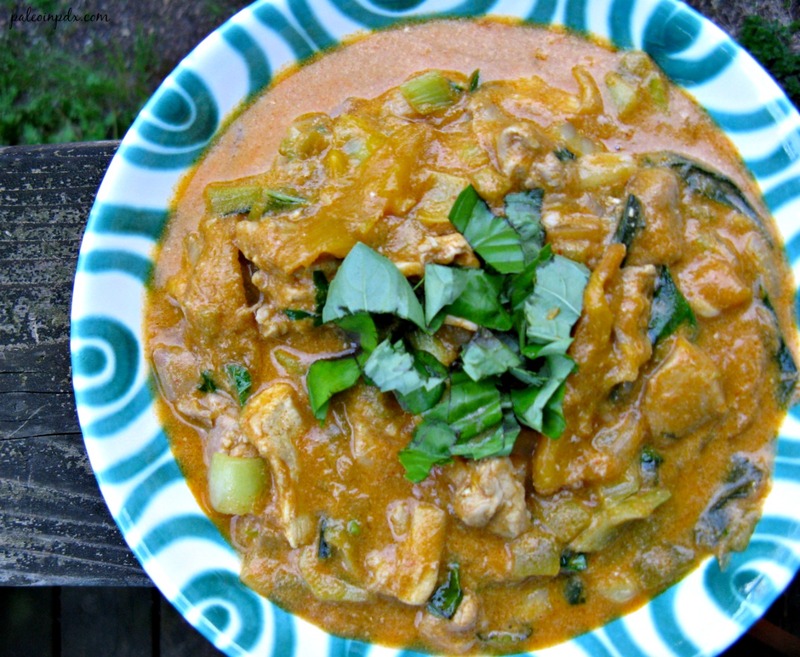 Meanwhile, in a medium-sized mixing bowl, whisk together the coconut milk and curry paste. Once mixed, add to the skillet with the green chilies. Cook 7-10 minutes. Lastly, add the bok choy, mango, cayenne and coconut aminos. Let cook 1-2 minutes more, until bok choy softens a bit. Then, stir in the chopped fresh basil. Serve over cauliflower rice or zucchini noodles. It’s delicious with both, but I thought it was best with the zucchini. 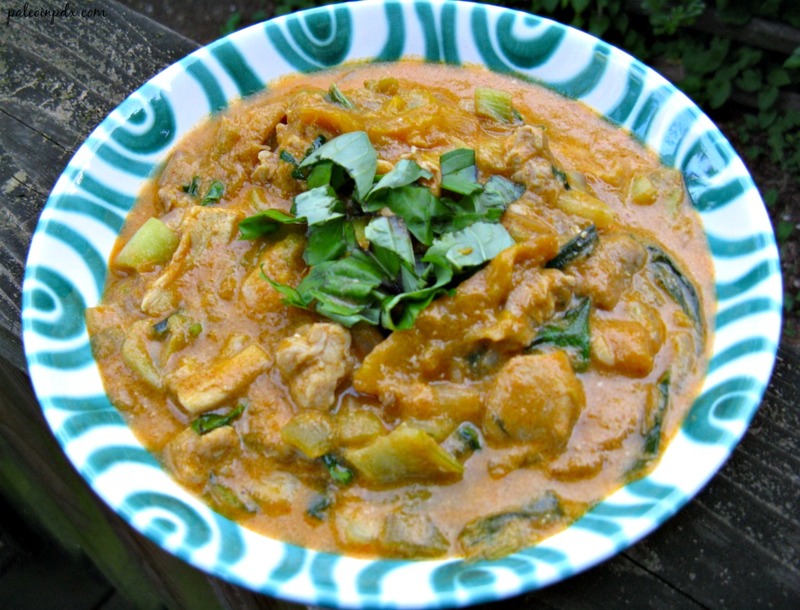 I have always loved Thai Curries! Promise I don’t work for this curry company (but I totally would ♥) I recently fell in love with a locally made, additive free, range of curry pastes made in Lake Oswego. I think you would love them too! http://www.thaiandtrue.com/ They are also available at places like Whole Foods. And thanks for posting so many great recipes!! Thanks for the info and kind words, Andrea. I actually am familiar with that brand, but don’t buy it because it contains rice bran oil, which is a major bummer. Thai Kitchen’s curry paste doesn’t have it or any other undesirable ingredients, so I always buy theirs. Oh, got ya! Good to know Thai Kitchen’s brand is A-ok. I have been making my own curry dishes forever, and for so long I was using the ones you get at Asian markets, and they usually all had some questionable preservatives. I made curry paste from scratch a few times too, but love using the pastes mixed with coconut milk for easy dinners! Came across your recipe though Chowstalker. Looks yummy! Thanks for checking out my recipe! The curry is actually not that spicy. It has a little kick to it, but it’s definitely not “hot.” I’m a medium spice kind of gal and this was just fine for me. In fact, it probably could have been even a tad spicier for me. If you’re worried, just use less curry paste and then mix more in if you feel like it’s too mild.